New Porsche chief Matthias Mueller says the automaker will have alternative-propulsion technologies that fit the brand. Porsche is testing a plug-in electric concept version of the Panamera sedan, though it has no plans to show the car publicly. Incoming Porsche chairman Matthias Mueller said at the Paris auto show that the car was developed for engineering purposes. It has an eight-cylinder turbocharged engine. The sports-car maker is studying a business case for the car, but no production decision is immediately likely. 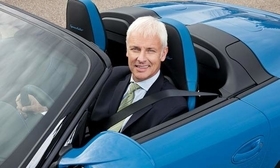 Mueller is took the helm of Porsche on Friday, replacing Michael Macht, who is now Volkswagen AG production chief. VW has been placing increased emphasis on alternative propulsion recently and made a splash at the Geneva auto show in March with the 918 Spider, which uses a mid-mounted V8 that works with electric motors. Porsche is also testing three all-electric Boxsters in 2011 and will raced the 911 GT3 R hybrid at Petit Le Mans at the weekend. “We will have solutions that fit to Porsche,” he said. The company launched a Cayenne hybrid this year and is adding a hybrid version of the Panamera next year. But perhaps the biggest question for enthusiasts: How does a plug-in Panamera drive? “Amazing,” said Mueller, who has personally taken the car for a spin.